I’ve used a Multi-column app for Twitter for a few years now, as it is e one way for me to compartmentalize and prioritize the people and topics that I’m interested in. Of late, I vacillate between Tweetbot and the new, Twitter-owned Tweetdeck, both of which are solid, while having a couple of flaws that keep me from adopting either 100%. This is a bit frustrating, but also provides an opportunity to break down what does and doesn’t work for me in each app, with the goal of outlining the changes that would result in a “perfect” app for my needs. I’m not going to enumerate over all of the feature of each as their respective Web sites can sell the products. Instead, I’ll highlight some of the features and gaps that impact how I use the apps. For reference, I use both on two different screens: a 13″ MacBook Air and a 27″ iMac. I’ll leave a review of the mobile apps for another day. Tweetbot’s column layout is clunky – if I add another column, I have to minimize and maximize the app in order for it to appear. I’ve found reordering of columns to be more intuitive with Twetdeck. Plus, in Tweetbot, the main Timeline column cannot be moved – I prefer to have the first column display a subset of the overall list of people that I follow. Tweetdeck provides this flexibility. Tweetbot’s display of attached media, such as photos and videos is cleaner, showing the thumbnail to the right of the text. 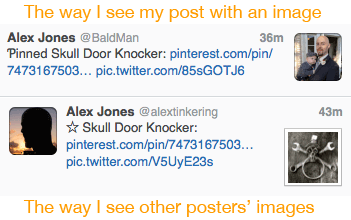 But, this is also the place where it shows my avatar when I tweet, so I don’t see the thumbnail. While this isn’t a huge deal, I post quite a few images via Flickr and Pinterest, so I like to see the thumbnail to confirm everything is working as expected. Tweetbot’s Hashtag mute functionality is excellent and convenient to use. All it requires is that I right-click on a hashtag, select Mute and choose a duration. Tweetdeck’s filtering capability is strong, but it is buried, so it isn’t convenient to use when I want to mute a specific hashtag. I miss the column functionality of the old Tweetdeck, which didn’t rely on Twitter lists, but instead allowed you to create a column that is post-filtered. The problem with using Twitter Lists, is that they don’t include @replies between two users that I follow. So, if @patramsey replies to @atxryan, that tweet doesn’t appear in a List, even though they are both in it. The conversation will appear in my main timeline. Neither app provides the functionality, but I still see it as a gap.